Given the huge popularity of Tinder, it was probably only a matter of time until new dating apps putting twists on the formula started popping up around the world. Now, already-married Muslim men are being invited to get involved in 21st century online dating with a new app dedicated to helping them find a second wife. 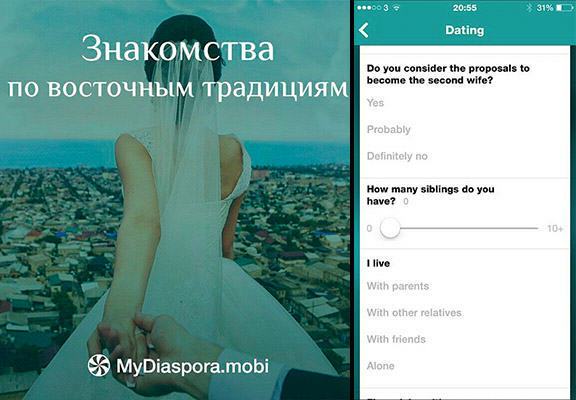 A Russian inventor came up with the concept for ‘My Diaspora’ and it gives polygamous Muslim men the opportunity to log in from Facebook and search for a potential second bride. Unlike Tinder and POF, this site isn’t dealing in quick hook-ups, but is specifically designed for men who follow the Islam practice of multiple wives. Users can message up to three potential brides-to-be per day and there’s even an ‘Add Father’ feature, allowing brothers and dads to join in the conversation between two matches, bringing it in line with the Muslim tradition of men and woman meeting in the presence of a patron. Women who download the app are asked whether they would consider becoming someone’s second wife, if they are willing to move to another country and convert religion, as well as standard personal information. The app is reportedly proving popular in the UK, despite bigamy laws technically outlawing the practice. It is still estimated that there are more than 20,000 polygamous marriages in Muslim communities of Britain today.